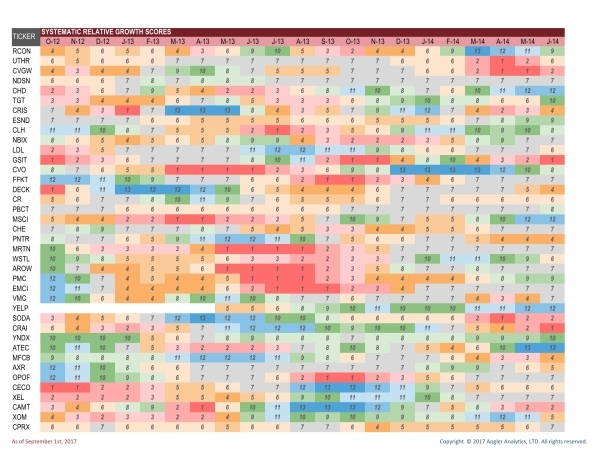 The quant approaches are usually characterized by some “proprietary” weighted fundamentals variables accompanied by some thoughts or commentary. The Angler Analytics quantitative research combines the proprietary analysis of the changes of a company, using different fundamental data relative to historic norms of a company. Our quantitative research assembles weighted fundamentals data, followed by calculating the relative value of the fundamentals data over a period of time. 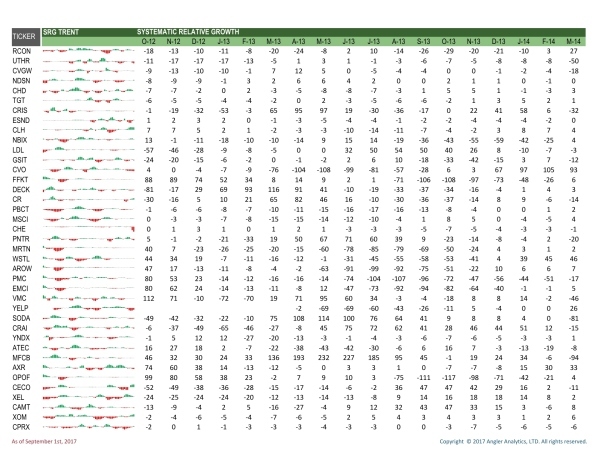 Then, it evaluates company fundamentals relative changes in trend. Lastly, it adapts over time, structuring the model output based on statistical distribution. Angler Analytics quant research can blend and accommodate the unique styles of Carl Icahn, George Soros, Warren Buffet, David Einhorn, or Bill Ackman. Companies are evaluated based on their own historical ability in order to consistently increase key investment-quality measures. This rewards companies that demonstrate proven efficiency, financial health, and disciplined growth environment. 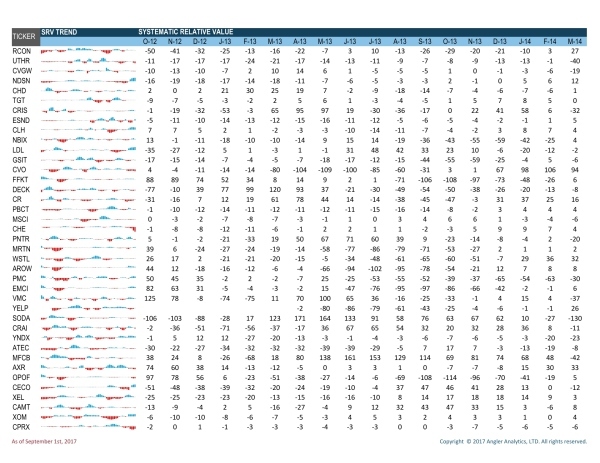 The Systematic Relative Rating System (SRRS) ​can be used to compare companies to their peers. The systematic relative score is based on their own historical statistics, revealing a company’s financial performance. The ranking and score ratings are applied to two fundamental dimensions: Growth and Value. 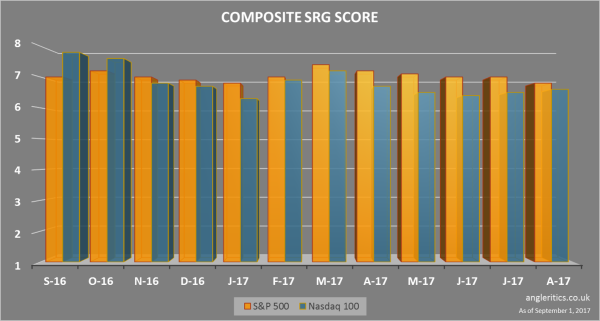 As a result, the Systematic Relative Growth (SRG) indicates that a company has the potential to grow quickly. Similarly, the Systematic Relative Value (SRV) indicates if the stock has a strong value direction and if it can create shareholder value through gradual buy-backs and dividends payments. Angler Analytics Ltd US equitiy research is updated monthly. Cyclicality selected carefully to not trigger false alarms due to a short period of examination, or to be a lagger as a result of a large period. 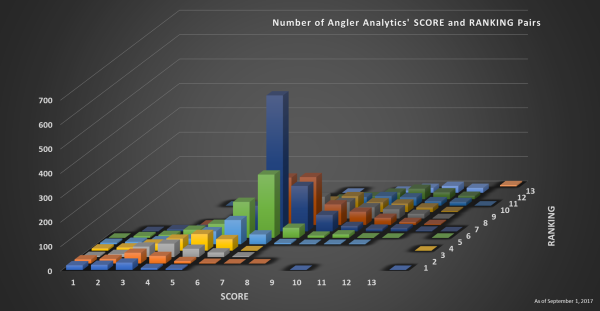 Angler Analytics ranking features a novel approach on assembling data based on historical performances and data characteristics. Angler Analytics' ratings can generate new investment ideas for retail investors or Goldman Sachs, Barclays, UBS, Morgan Stanley, Credit Suisse, or Vanguard institutional investors. 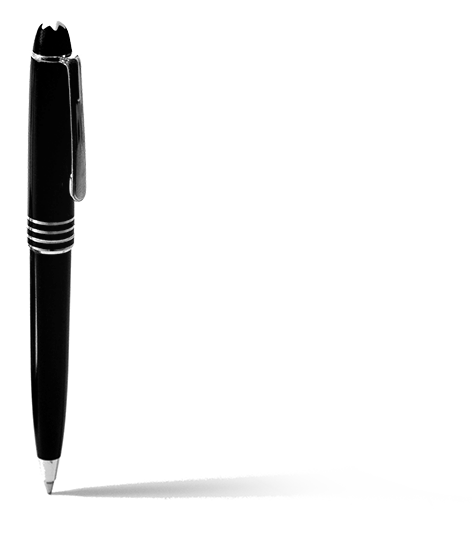 It enables portfolio analysis, quality assessment and attribution for uncommon holdings. The Angler Analytics research provides a new insight that the Financial Times reporter or WSJ journalist can talk about. Moreover, if business activities are supposed to be roughly similar and the Angler Analytics research indicates different things, then businesses are actually more likely doing different activities. The fundamentals data were carefully selected to reflect the companies’ potential increase in strength, capital adequacy, growth path, and asset performance. We collect the selected financial data since 2009, where available. The year 2009 was purposely selected to reflect the recent shift in companies’ behavior, technological trends, rapid products/services development and volatility. Our secret receipe has two parts: 1) original method to calculate relative value of the fundamentals data over a period of time to determine the strength and weakness of the fundamentals, and using two fundamentals metrics; 2) novel approach to determine the level of historical change. The Angler Analytics Ltd research algorithm calculates relative changes in trends by determining the recent fundamentals changes and evaluating it with comparable historical rates. Moreover, to have uniformity and repeatability of how we evaluate companies, Angler Analytics Ltd associates fundamental performance to companies’ market cap (price and outstanding volume). This make the case for releasing updated reports on a monthly basis. Since fundamental data is updated in three-month cycles and market cap is updated daily, it is advised to select a cyclicality that is not affected by false alarms generated by quick swings in stock prices and that uses consistent financial data. 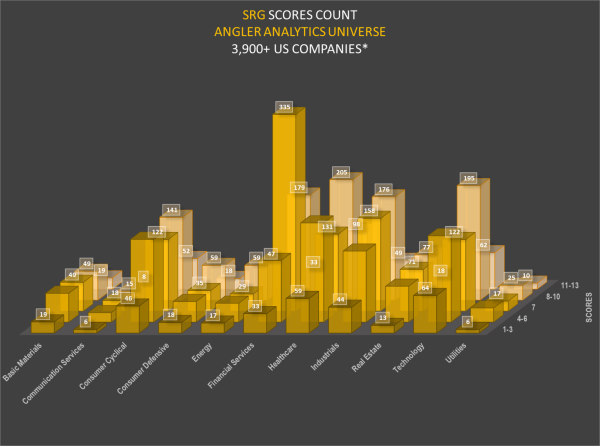 Companies are scored based on their own historical statistics. 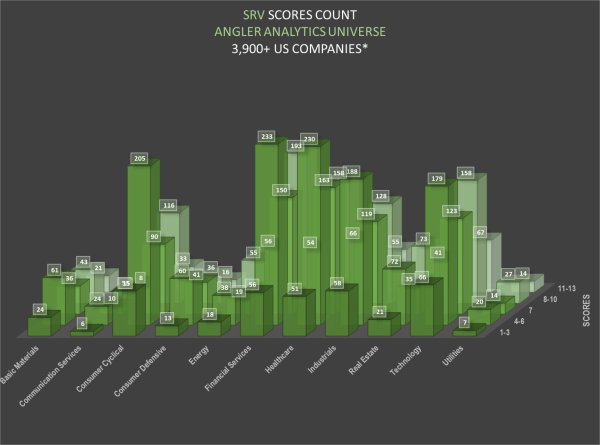 The Angler Analytics has two stock rating systems: the company Ranking and the Score. 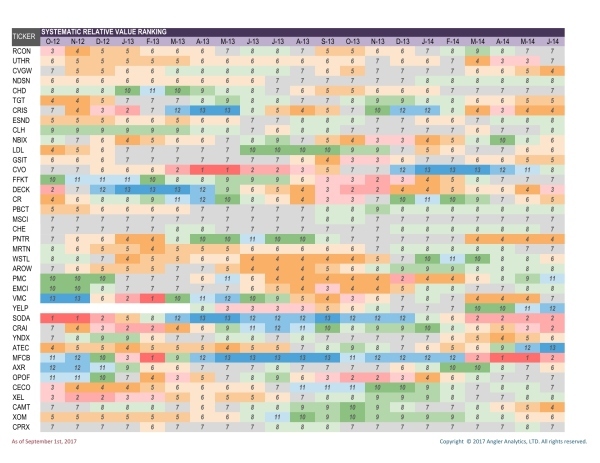 We are looking at the companies’ financial performance direction relative to their peers in the same industry group. This helps identify companies that support their product cycle without saturation of other companies' products or offerings. 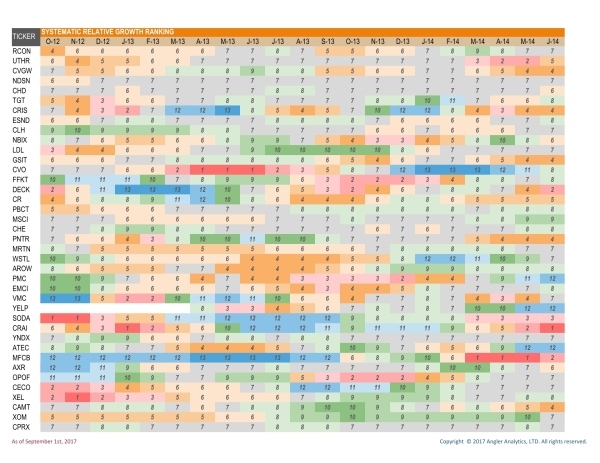 ​The companies are ranked on a 1-13 scale, 13 being awarded to the most favorable. A company must have a calculated performance for the recent period and the historical reference. We are looking at the companies’ own financial performance orientation, independent of their peers in the same sector group. This helps identify companies that provide 1) new products and services; or 2) re-establishes investment-quality progress without being adversely compared to companies that have already established a solid base. The ranking and score ratings are applied to two fundamental dimensions: Growth and Value. ​Similarly, the Systematic Relative Value (SRV) indicates that the stock has a strong value direction and if it can create shareholder value through gradual buy-backs and dividends payments. 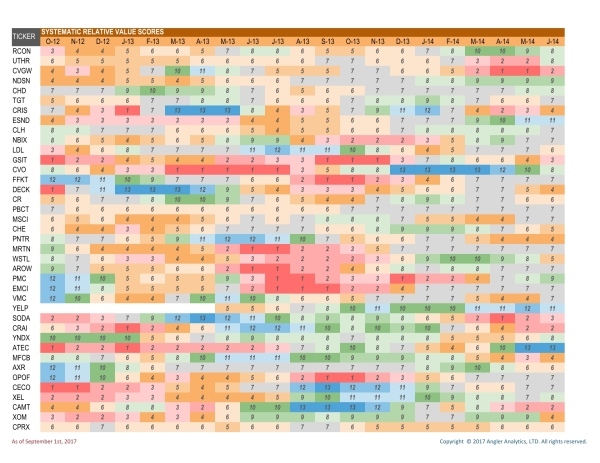 A criterion that predicts where the next investment will be (which asset classes) based on market research and psychological criteria. The human “investment judgement” will also need to be supplemented by quantitative market research that assesses the opportunities against wide sources of financial information. Based on the outcome of both, the investor then gains exposure to that asset class. A trading strategy that sets the rules that can be followed. Effectively one or more algorithms that highlight assets ready to boom and a system, with risk controls, to take advantage. 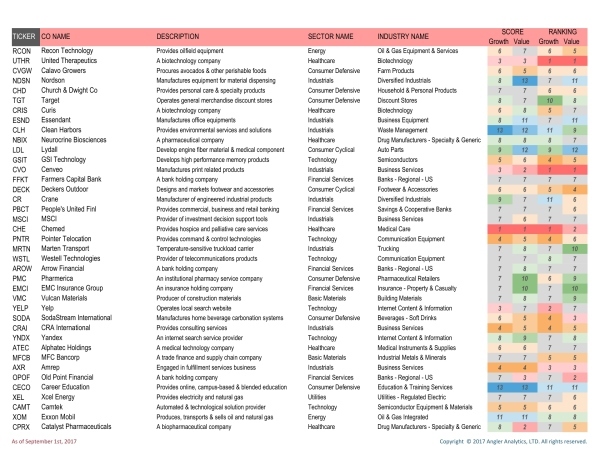 Filtering criteria to identify sectors/assets that are “undervalued” and have potential growth perspective, nevertheless also recognize sectors/assets out of favor that market values have been pushed below their true worth. After that identify factors that might change market perception and obviously also identify any true reasons why things are as they are. 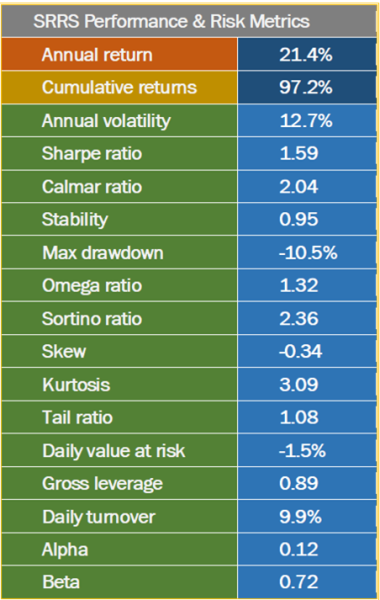 Using Angler Analytics quantitative rating model to shortlist candidates such as asset classes or individual stocks you then analyze the shortlist to weed out the obvious non-starters based on a wider knowledge of the financial press. You have a mathematical approach to financial markets and how the markets behave. ​According to market theory, markets behave rationally and the given price of an asset in a free market is based on all public market information. This is only part of the story. I have a different view of financial markets and observe that they do not move rationally some, or indeed all, of the time. The missing element is psychology and human behavior. The history of financial markets is characterized by a series of bubbles in asset prices which are driven by a massive herd of investors who follow the latest “new thing”. There is substantial capital chasing returns on assets and this “hot money” moves fairly rapidly from one asset class to another. When the spotlight falls on an asset class that is undervalued, or is perceived as undervalued, the prices of these assets inflate, usually to levels far in excess of their fair value, as more money piles in. It seems that the trick to making money is recognizing these assets before the herd and investing before the values become too inflated. Having jumped on the wave you can either actively trade in and out of the asset taking profit/hedging the downside on a daily, hourly, minute by minute basis or simply take a long position and cash out at a pre- agreed profit condition. Nota Bene, as bubbles inevitably burst it is important to be disciplined and not too greedy and have rules you stick to.